ICD and Brookfield officials at the ceremony. 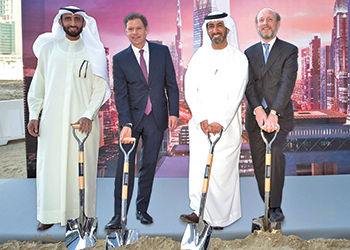 The Investment Corporation of Dubai (ICD), a government-owned wealth fund, and Canada’s Brookfield Property Partners have broken ground on their 53-storey office and hotel tower project worth over $1 billion in Dubai. ICD Brookfield Place, a 1.5-million-sq-ft mixed-use development features a landmark office tower, large open civic spaces, world-class food emporium, and fine dining restaurants. The 53-storey tower will provide over 900,000 sq ft of Grade A lettable office space. The top three levels of the tower will comprise the exclusive sky view suites, a crowning feature of the landmark building. The state-of-the-art office and retail development, located in the Dubai International Financial Centre (DIFC) district, has been designed by world-renowned architects Foster + Partners. ICD said it has reached an agreement to form a joint venture partnership with Brookfield to develop the project. The construction work will commence immediately and the project is expected to be completed in 2018. Best-in-class shopping, dining, fitness, and private club facilities will fill an adjacent five-storey, 150,000-sq-ft retail centre fronting Al Sa’ada Street featuring multiple terraces and an open garden on the top level with uninterrupted views of Burj Khalifa. The office tower and retail building will be connected by large, architecturally striking pedestrian pathways with seven underground levels of car parking to accommodate 2,700 vehicles, it stated. Framed by fine dining restaurants and a chef-driven food emporium, the 31-m-high, 18,000-sq-ft landscaped public area will showcase a range of arts and cultural events that are a hallmark of Brookfield Places around the world, including the award-winning programmes at Brookfield Place New York, Toronto and Perth, said the Dubai group. A new retail connection and public garden will link the food emporium and public realm at ICD Brookfield Place to the existing DIFC gate precinct. JLL and CBRE are acting as the joint leasing agents for ICD Brookfield Place, it added.